​​​​​​SAN ANTONIO – Port San Antonio is proceeding with plans to add 5,000 new jobs by 2020 inside the 1,900-acre industrial complex. Port San Antonio's location is nearby Joint Base San Antonio Lackland Air Force Base. The company moving forward with the construction on a new 90,000-sf technology industry office building costing $20 million. 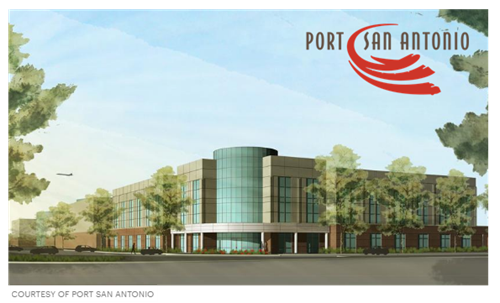 Companies inside Port San Antonio already employ 12,000 workers operating in aerospace, manufacturing and cybersecurity and the new addition expected to create up to 300 jobs. There are plans for five other buildings inside a new technology office campus that will spread across 17-acres, and adding 500,000 sf of new office space. Several cybersecurity and software companies already lease space inside the complex including; Booz Allen Hamilton, Fidelis Cybersecurity, General Dynamics, Radiance Technologies and many more. San Antonio City Council is expected to approve $1.5 million to pay for public infrastructure on the new building site in mid-April. The building was designed by Beaty Palmer Architects, and will be built by San Antonio-based SpawGlass Civil Construction Inc.